So for the letter R, we are travelling to Iceland. Iceland is a Nordic island country in the North Atlantic and is the most sparsely populated country in Europe. Iceland’s cuisine is based on fish, lamb and dairy products with little or no utilization of herbs of spices. Due to its climate fruits and vegetables are not generally a component of traditional dishes. Rye is a grass grown extensively as a grain, a cover crop and a forage crop. It is a member of the wheat tribe and is closely related to barley and wheat. Rye grain is used for flour, bread, beer, crisp bread and animal fodder. It can also be eaten whole, either as boiled rye berries or by being rolled, similar to rolled oats. I used a combination of Rye & Spelt flour. What fascinated with respect to this thick Rye bread was once cooked we have to dip it in warm water for the bread to be soft. This was a rather difficult and unusual task. Dipping it in warm water helps the bread to stay moist, else it will be come hard as the flour is too dense. I have taken the recipe from here. This bread can be enjoyed with some butter or meats and veggie’s. I simply topped it up with some feta cheese and enjoyed with a bowl of warm Roasted Pumpkin Soup. Rye Flatbread is made with Rye flour or a combination of flours Rye/Spelt/Wholewheat and is often enjoyed with meat or butter. Combine the flour, baking powder, and salt in a bowl. After 5 mins or so the mixture will be a bit cold i.e. when you are able to handle the flour mixture with hand, knead it to a semi stiff dough. One can use a drop of oil to just grease it at the end if required. Divide dough into equal size balls (7-8). Roll each ball into a 4 inch circle and 1/2 inch thick. Prick the tops of the rolled bread with a fork. Heat a pan and once medium hot, place the bread on the griddle and cook until the top begins to dry and the bread gets brown bubbles appear on the bottom. Cook in on both the sides until done. Remove flatbreads from the griddle and dip in warm water. Shake of excess water and stack them in a clean kitchen towel. Keep them wrapped so that it does not dry out. Best served warm with some soft cheese or meat. One can use only Rye Flour or a combination of Rye and Spelt or Rye and Wheat flour. Rye breads are real earthy and rustic and so is this bread. It looks rustic and feta is a great cheese to serve it with . The bread is new to me and it was great learning about this new cuisine . Rye flour has a lovely taste and I try to bake with it as often as I can…love this flatbread with rye and spelt. Would have tasted divine!! Ryeflour makes excellent healthy flatbreads but adding spelt flour makes more interesting. Such a rustic style flatbread na. I can imagine having this bread with some cheese toppings. That is a very interesting method to cook the flatbread. I have never come across a procedure where the flatbread is dipped in water and drained. New flatbread and a unique cooking method.! I have never used rye or spelt in recipes but the breads look like our rotis. So rustic and nutritious. The method of dipping in warm water is new and I am glad I learnt something new today. 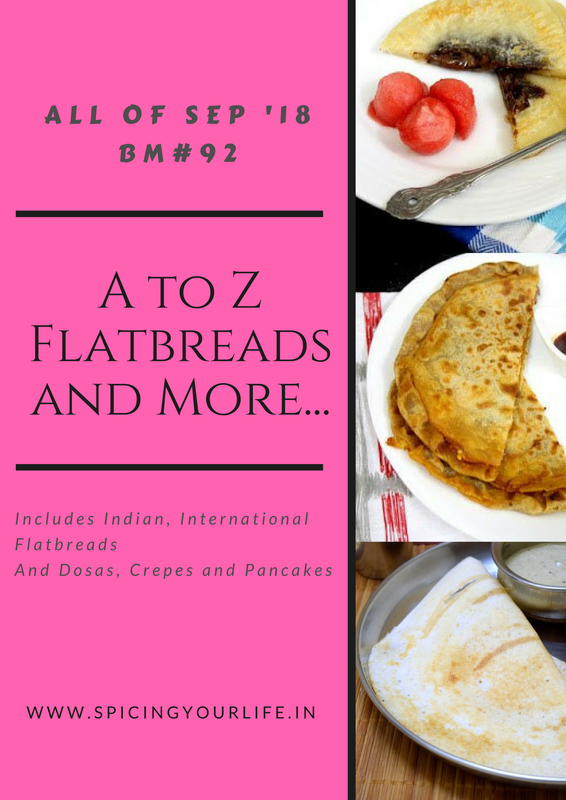 A rustic looking flatbread, never heard of it but then that what BM teaches us, new dishes from different cuisines of the world. Like how you’ve explained a bit about the eating habits of the people of Iceland. Nice reading about the cuisine. I am yet to use Rye flour. The flatbread looks very filling. And with that topping and side side I am sure I will love it. Travelling to different and trying their bread is a fantastic experience. This paratha looks so healthy and tasty.. quite new for me. I have never used Rye / spelt.We don’t get them here.But going by the pics, the flatberad looks so rustic and will go well with a nice gravy type side. Such a rustic bread this is and I love traditional recipes. They are so simple with the minimal ingredients and taste so delicious. Lovely pick for the alphabet. The bread looks rustic. It is really interesting to know that bread is dipped in warm water to make it soft. never heard about rye flour. but this bread looks interesting to make. Great choice for letter R.